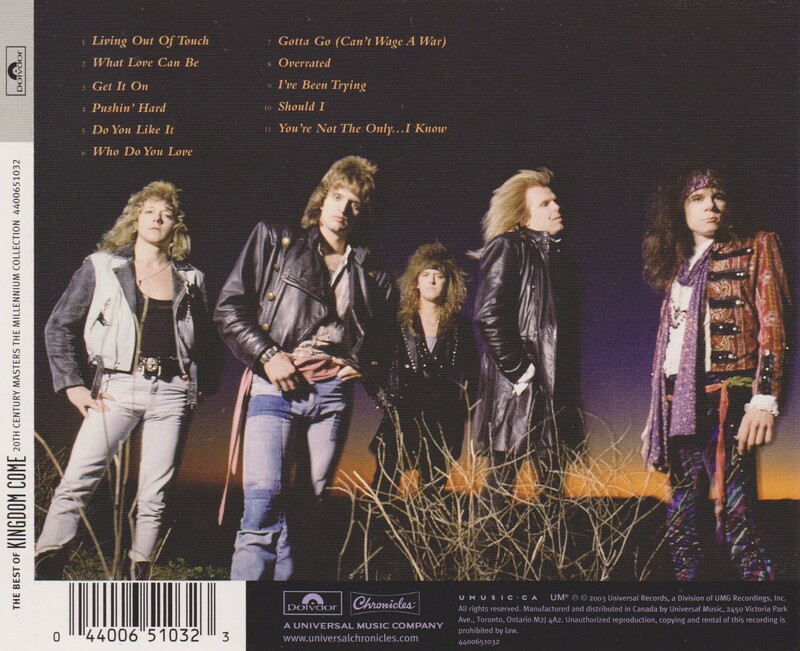 Kingdom Come are a German/American band that rose from the ashes of Stone Fury. For those who may not remember, Kingdom Come were quite infamous in their day. Gary Moore wrote a song called “Led Clones” (with Ozzy singing lead) about Kingdom Come and bands of their ilk who were seen to be milking the now defunct Zeppelin cow. The “Led Clones” riff directly aped “Kasmir” by Zeppelin, as did Kingdom Come’s lead single “Get It On”. A little Zeppelin influence is fine, but Kingdom Come enraged Jimmy Page himself when one of their guitarists claimed he’d never heard a Led Zeppelin album. The Zeppelin angle was one direction that Kingdom Come exploited in their early days, and though they grew out of it by their second album, the damage had been done. Their nickname became “Kingdom Clone”, the punchline of many jokes. This is why a simple 20th Century Masters compilation may be all the Kingdom Come you actually need. Herein you will find all but one of their hits, and a fair few tracks from their first three studio albums. Two guys from this band ended up in Warrant: Rick Steier and James Kottak, who is also the longest-serving drummer that the Scorpions have ever employed. By the third album, the original lineup had completely dissolved leaving singer Lenny Wolf the sole original member. “Get It On”, the single that made them famous, which wears its Zep influences on its sleeves. “What Love Can Be”, essentially Lenny Wolf’s transparent rewrite of “Since I’ve Been Loving You”. “Do You Like It”, the first single from sophomore album In Your Face. The second album was a move away from that. Keith Olsen got a sharper, more vibrant sound than Bob Rock did (though Rock really got a great drum sound for James Kottak). Reportedly, some stores refused to stock the second LP because they thought the band’s name was Kingdom, and the album called Come In Your Face. Too bad, because the incendiary “Do You Like It” was critically acclaimed for its drive. The other In Your Face tracks included here absolutely represent a move away from Zeppelin and towards a more mainstream, slightly European rock sound. Good songs, especially the mid-tempo “Gotta Go (Can’t Wage a War)”. The third album, Hands of Time, came and went without a sound and Lenny was dropped from the label. Reviews suggested it was soft and ballad oriented, but there are two decent slow rockers here from that album. “Should I” has a slow grind topped by a passionate vocal. The one included ballad, “You’re Not the Only…I Know” has a weird title but a great melody. The great thing about the 20th Century Masters series is the ability to get key hits for a low price from bands that you may not want albums from. The 11 tracks on the Kingdom Come edition are all worth owning, no duds in the bunch. That makes this CD an easy one to pull the trigger on.